This is a 5-part series. The Chakras are energy centers in the subtle body. Each Chakra has a number of functions and purposes: mind, body, and spirit. The Chakras are also a perfect framework for personal growth and development. When the energy flow in a Chakra or the entire system is disturbed, it can be expressed as emotional, mental, physical, or spiritual ailments. You have the power to heal and balance the energy centers and fields in your own body! This series is for both beginners and the advanced. Dr. Christina is an expert in the Chakras and offers a unique viewpoint on energy centers and combines elements from various systems and traditions. Learn all about the major Chakras, minor Chakras, transpersonal Chakras, subpersonal chakras, different Chakra systems, theories, history, and their locations, themes, functions, and purpose. Discover how the Chakras interact with kundalini, the aura, light body, the meridians, yin/yang, and various subtle energy flows. How these energies contribute to emotional, mental, physical, and spiritual health will be discussed. This class builds a firm foundation for the upcoming classes in the series. All participants will also receive an intuitive Chakra reading with Dr. Christina! Length: 4 hours. Fee: $80. Register at the bottom of this page. Everyone has the ability to develop awareness of, read, intuit, and work with energy. Experience and have a deeper understanding of your own energy flow, your Chakras, and the Chakras of others. How do your Chakras look, feel, and sound? How do others’ Chakras look, sound, and feel? How do you perceive and read energy? Develop your intuition and inner knowing through the Chakras. Length: 4 hours. Fee: $80. The Chakras are energy centers in our body and openings for life energy to flow into, out of, and through our aura and bioenergy field. 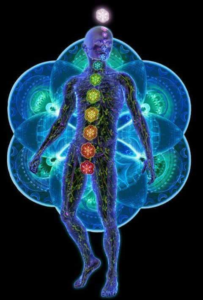 Low energy or blocked energy in a chakra (or the entire system) can lead to spiritual/emotional/mental/physical imbalance, disharmony, disease, maladaptive patterns, stress, and/or fatigue. Learn how to tell if a Chakra is out of balance and how to do chakra assessments. Learn techniques to clear, balance, align, and heal your own chakras AND the chakras of others. Techniques include energy work, acupressure, reflexology, aromatherapy, crystals, sound, yoga, food, tai chi, and more. We will be practicing techniques hands on! Length: 4 hours. Fee: $80. Students will be introduced to more advanced methods of clearing, balancing and healing the Chakras. Techniques include energy channeling, visualizations, breathing, yantras, bandhas, and personal growth work. The role past life and transpersonal issues have in Chakra health will also be discussed. Pre-requisite: How to Balance the Chakras. Length: 4 hours. Fee: $80. Develop a deeper awareness of your aura and your bioenergy field. Experience your aura and the aura of others. Learn about the layers of the aura, colors, sizes, and shapes. Learn about psychic protection, energy hygiene, energy boundaries, and how to ground and center energy. You will also be introduced to various methods of charging and cleansing the aura. Length: 4 hours. Fee: $80. Included with each class: Each chakra class is $80 and includes a 4 hour downloadable recorded class taught by Dr. Christina, a detailed manual in PDF form, and additional written materials and exercises. Class one includes a mini-chakra intuitive reading. Complete all 5 classes and receive a 30 to 45 minute individual phone or web consultation with Dr. Christina to discuss class content and to answer any of your questions. Timeframe: There is no timeframe to complete the classes. The recordings are downloadable, so you always have access to them! Concerned about taking an online class? REGISTRATION: Payment in full is required before any class materials will be sent to you. All sales are final. Pay for the whole series in advance and receive a 10% discount! After payment is received, within 24 to 48 hours Dr. Christina will email class recordings, class workbook, and additional materials to student. Contact Christina with any questions or comments: 608.393.7353 or mindsoulandself@yahoo.com.